These ideas are not to be sniffed at! First assemble the shark. Ask your kids to draw a tail and 3 fins (two for the sides and one for the top of the shark’s head). 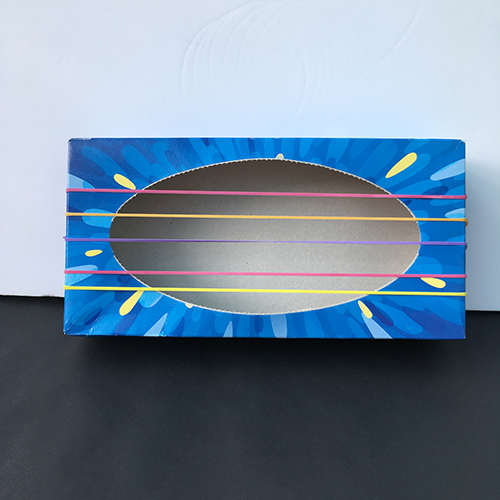 Then tape them all on to the tissue box, keeping the opening of the box at the front. Now they can paint their shark. We mixed grey paint by combining black and white. Next, make the teeth. Cut a circle of white card the same size as the opening of the box and then cut it in half. Now your kids can cut zigzags into it to make jagged fangs. Once the shark’s dry, your kids stick on the teeth and googly eyes. Rarr! First, ask your kids to paint the tissue boxes green. Then they can cut three pointy monster toenails from card. 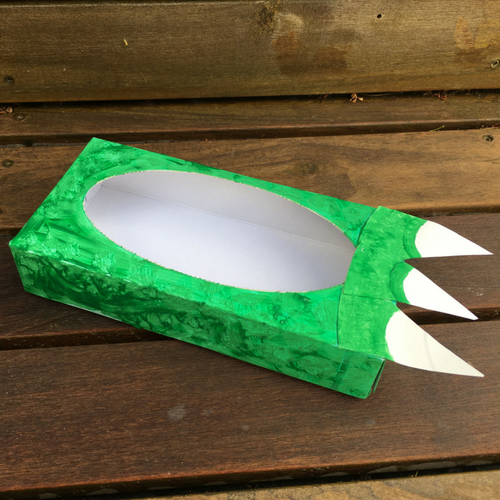 Once the tissue boxes are dry, they stick the nails on – then wear their funny monster feet! 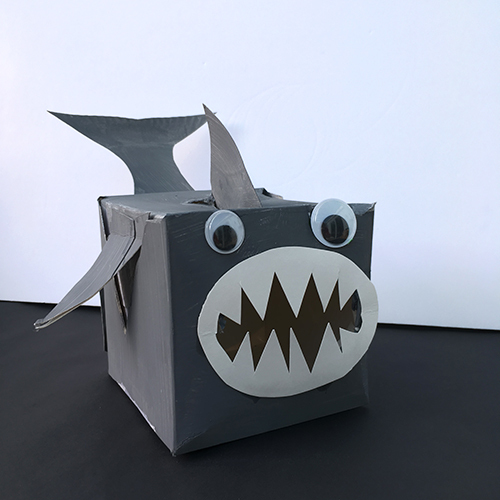 First your kids turn the tissue box into a greedy monster – the opening is his big mouth. They add googly eyes, card teeth and a paper tongue. 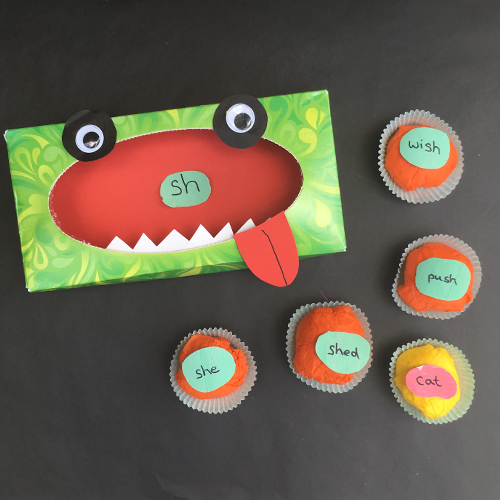 Choose a letter sound to glue on the monster. Now they suggest 4 words that have the letter sound in – it could be at the start, middle or end of the word. And one word that doesn’t! They write the words on the cakes and feed them to the monster. BURP! But he won’t eat the word that doesn’t have his letter sound in. Tip: Play this game again with a new letter sound! Just peel off the words and write new ones. 5. Still got some tissues left? 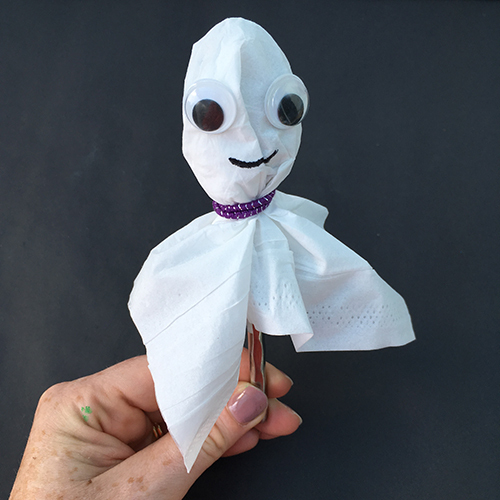 Make a ghost! Help your child put the tissue over the wooden spoon and secure it with an elastic band. Now they add the googly eyes and smile. Who can they scare with it? BOO!